metal on metal. In a structure with no attic and no trusses, the ceiling shape matches the roofline. 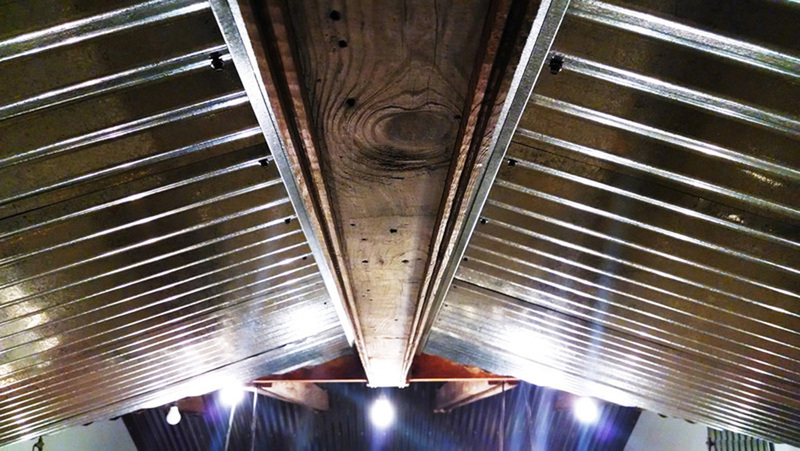 Continuing the connection, galvanized aluminum panels wrap the roof outside and the ceiling inside. The metal pulls light throughout the interior, bouncing it over walls and into loft spaces above. reclaimed from within. Exposed wooden material is salvaged from the original structure. Former ceiling joists comprise the collar ties and doorway trim. Former roof decking wraps new beams and trims the intersections of collar ties and ceiling. The old window security grate finds new purpose as the dining table light fixture. integrated trim. Drip cap, another roofing material, trims the metal ceiling where it meets walls and beams. Custom-bent ridge caps are flipped to finish the underside of interior valleys. The groove side of roof deck boards lines the exposed edges of beam wrap overhangs and collar tie trim plates.